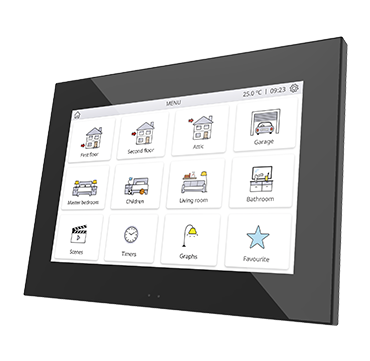 Z70 COM* Color capacitive touch panel of 7" with video intercom. Color capacitive touch panel of 7" with video intercom. 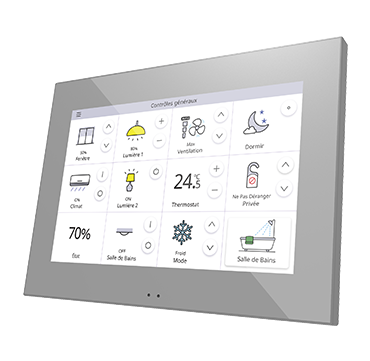 Z70 COM is a color capacitive touch panel with 7" display, including the integration with the video intercom Zennio GetFace IP System. 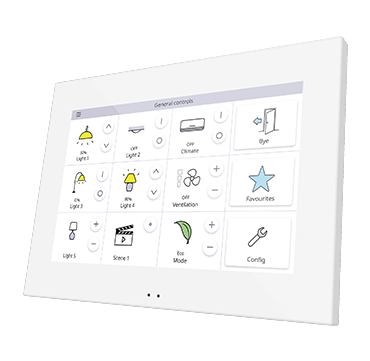 Complying with minimalist aesthetics, provides a total control in smart homes and a complete communication with the video intercom, including microphone and loudspeakers. The proximity sensor built-in makes the screensaver appear when the touch panel is not being used and the luminosity sensor adjust the brightness automatically. It is possible the remote control from smartphones and tablets through the free mobile app. Z70 COM incorporates an internal temperature probe, thermostat and 4 analog-digital inputs. It includes USB port for configuration download and Ethernet port. Plug&play system without additional configurations. Installation in standard double mounting box. Accessories: temperature probe, motion sensor. No compatible with other videointercom systems different from Zennio GetFace IP.